Search Results for "green screen woman rear view"
Female construction manager against green screen. Rear view of woman in orange safety vest and hard hat holding blueprint. Rear view of cleaning service worker or housewife with cleaning supplies against green screen. Woman holding washing tools and products in washbowl. 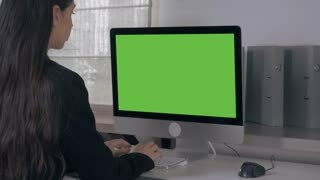 Close up for a woman looking at a white tablet with a green screen. Girl in white shirt working in office in front of tablet with chroma key, rear view.